Various materials are used for the manufacture of pins but basically there are only two types of reliable pins. These are either case-hardened or Nitride hardened. 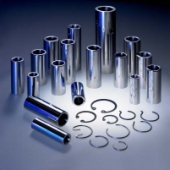 All of our high performance pins are of the nitrided type. Our design takes into account, strength, reliability and light weight with an excellent surface finish both inside the pin bore and the bearing surface. Unless otherwise requested, all of our pins are retained by round wire circlips. Measurement of surface finish is done using ultra high accuracy equipment. A traditional steel rule has been placed on the component to give a sense of scale to the measuring head that contains the extremely fine measuring stylus. One of the operations of gudgeon (wrist) pin manufacturing. All pins are fine bored to the highest accuracy and finish possible, in extreme applications the bore is also honed.